I read this article and found it very interesting, thought it might be something for you. The article is called Chocolate Mousse Recipe – Mousse au Chocolat and is located at http://eugeniekitchen.com/chocolate-mousse/. 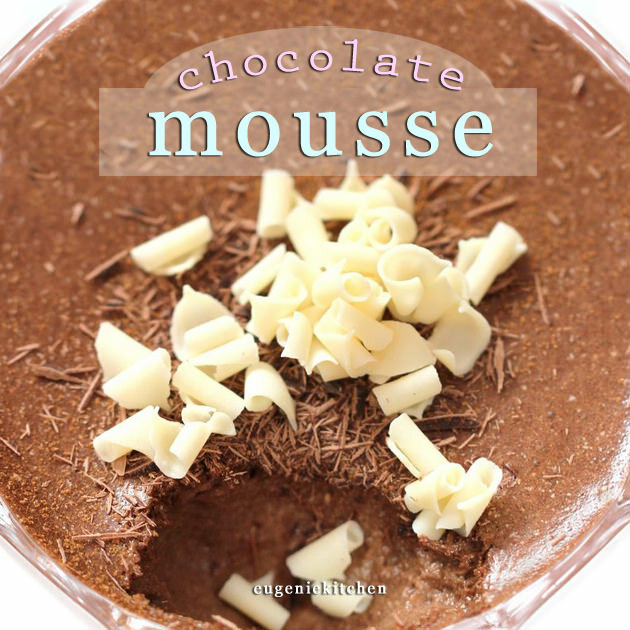 Do you like mousse? I love it. It is normally based on beaten egg whites or whipped cream. And you can give it many different flavours. With fruit purees, you can make mango mousse, blueberry mousse, lemon mousse, etc. And also you can make savory mousses such as fish puree and foie gras. I love foie gras mousse, it’s a perfect amuse buche. And today I am going to make one of my favourite desserts, dark chocolate mousse, mousse au chocolat. * This is typical French, which means very sweet. So make sure you use bittersweet chocolate, which contains 70%+ cocoa. Boil the cream On a medium heat, pour in the whipping cream in a sauce pan. Occasionally stirring, bring the whipping cream to a boil. 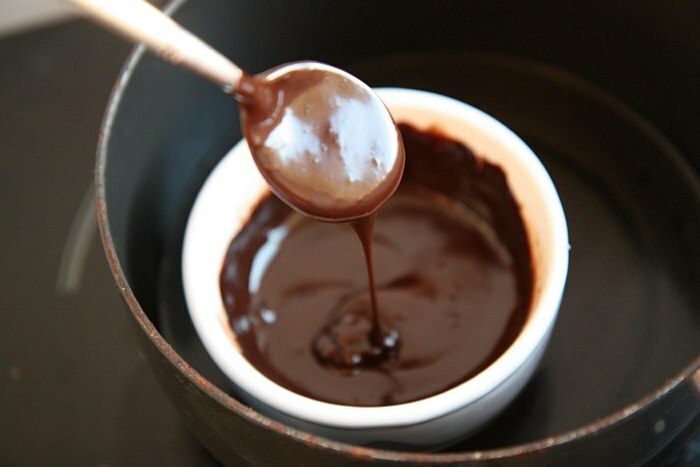 Add cream to chocolate In a heatproof bowl, add in chocolate. For chocolate mousse, it’s very important to use good quality chocolate. Today I used Nestle chocolate for pastry. And pour in the boiling whipping cream. Whisk until combined. The cream is hot enough to melt the whole chocolate. Stir in egg yolks Now, separate the eggs. Add egg yolks in the chocolate mixture one at a time, stirring with a whisk until homogeneous. Then add salt and give it a final mix. Make French meringue In another bowl, beat the egg whites until pointy. Then slowly add in the sugar when whisking. Keep beating incorporating the air bubbles until soft peaks form. Be careful not to overbeat. This is French meringue. Combine all ingredients Add 1/3 of meringue into the chocolate mixture and whisk to combine. Then, pour in the chocolate mixture into meringue. This is the way to mix dense mixture into light mixture. Delicately fold until smooth. The volume will be diminished, which is normal. But still be careful not to break the meringue. Divide in glasses and set Then, with a ladle, fill the dessert glasses, small bowls or ramekins with the batter. It’s quite thin right now but that way surface would be clean and smooth. Chill in the refrigerator overnight. Don’t freeze. If you freeze, the texture of raw egg white will ruin the mousse. You can decorate mousse au chocolat with grated dark chocolate, white chocolate, rose chocolate, ground cinnamon, ground ginger, etc. It’s up to you. Today I am dusting with ground cinnamon, I love a touch of pungent scent of cinnamon in it). And grated dark chocolate and white chocolate for garnish. Chocolate mousse – It has light texture with bubbles. Don’t forget to follow me at Facebook http://www.facebook.com/eugeniekitchen. Thank you watching, Bye for now! Now enjoy heavenly chocolate mousse! And for future reference, how would I make mousse with a fruit puree? is it ok to eat uncook white egg batter? Raw eggs are not recommended to babies and toddlers, elderly people, pregnant women, people who are unwell. It was whipped. Good luck, Ravza!